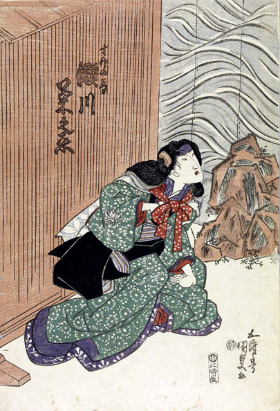 The "Tokaiya" scene is the second scene of the second act of "Yoshitsune Senbon Zakura". It is either staged independently of the rest of the play, along with "Funayagura" and "Daimotsu no Ura", or as part of a tôshi kyôgen production of "Yoshitsune Senbon Zakura". Yoshitsune and his followers have arrived at Daimotsu Bay outside Ôsaka. There they await a boat to Kyûshû, where they have decided to take refuge. The weather is rough, and they are forced to wait at the Tokaiya Inn run by the shipping agent Ginpei, who lives there with his wife Oryû and little daughter Oyasu. Oryû is preparing a meal. Benkei, now disguised as a traveling priest, goes to leave the inn. When he steps over the sleeping body of the child Oyasu, he finds that his legs are unable to move. This, we will understand later, is because the child is of imperial lineage, and thus Benkei's action is one of great disrespect. A retainer of Yoritomo named Sagami arrives and demands a ship to take him to Kyûshû, where Yoshitsune is rumored to be planning to escape. When Oryû tells him that the next available boat has already been spoken for, he says that he will force the other would-be passengers to heed his demands. At this tense moment, the master of the house, Ginpei, returns. Sagami suspects that the other passengers may be the very men he is seeking, and bares his sword as he goes to confront them. He is disarmed by Ginpei and runs off. At this, Yoshitsune emerges to thank Ginpei for his help. Ginpei says that the storm seems about to break, and urges Yoshitsune and his party to take flight before other pursuers appear. Yoshitsune and his men board a barge for the ship that will take them to Kyûshû. Suddenly, Ginpei reappears in armor and bearing a halberd. He reveals that he is actually none other than the Heike warrior Taira no Tomomori, and that Oyasu is in reality the boy Emperor Antoku. Furthermore, the woman posing as his wife Oryû is actually Suke-no-Tsubone, wet nurse to the child Emperor. 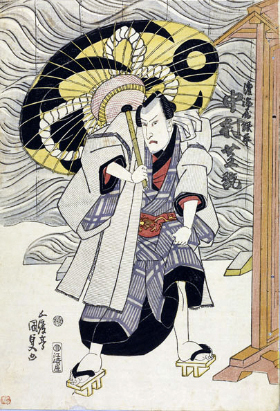 Tomomori has posed as the commoner Ginpei as he awaited his chance to get revenge on Yoshitsune. The quarrel just now with Sagami was deliberately devised in order to gain Yoshitsune's trust. Now Tomomori looks forward to getting revenge on Yoshitsune for having defeated him in battle. Tomomori tells Suke-no-Tsubone that, if in fact he is not successful in his mission, all the lights on his boat will be extinguished. Should she see that signal, she is to take the child Emperor and commit suicide with him by jumping into the sea.